Maria has served as the master trainer and instructor of personal development and mentorship programs and workshops for young women over the last five years serving hundreds of students. Through her entrepreneurial endeavor of Embrace Her Legacy, she has also given dozens of talks to high-school and collegiate level students. She has been coined “the OG Mentor” and is a social entrepreneur, motivational speaker & spiritual teacher, author of Take the Limits Off Your Legacy, producer, and women’s leadership advocate– she has embraced her mission of empowering others to live a life that embraces a limitless legacy. After leaving her high-profile career in the music business to pursue her purpose of empowering others to live life in purpose, give birth to their dreams and define their legacy, Maria (who has been deemed by clients and peers as your personal “Goals Girlfriend”) has proven that she is the essence of living a purpose and legacy driven life in order to inspire others to follow suit. Featured in the ESSENCE magazine, Latina.com, Heartandsoul.com and recipient of several notable accolades, she is an influential leader whose faith, zealous drive, experience, framework, story and impact are key to the leadership development in women and girls around the world. Her contemporary style of transparency, authenticity, wit, humor and positivity are key to in her message of transformation. Dr. Arabelle LaCroix Pembroke is a New York City educator with over 10 years of experience. Her scholarly interest is in the literacy development of urban adolescents. Dr. Pembroke has devoted her life to closing the achievement gap by ensuring that marginalized students develop advanced literacy skills in time for college and career. Dr. Pembroke immigrated to the United States at age 8 speaking only French. Her experiences growing up as a poor, black, female, English language learner helped shape her belief that language proficiency and mentoring is essential to high academic performance and a better quality of life. ​Dr. Pembroke currently serves as an assistant principal of a large middle school in Queens. She has a proven track record of impacting student learning and transforming teacher practice. She is committed to mentoring and empowering young women. In her free time, she enjoys dining and is always on the hunt for good empanadas. Dana Johnson is an on-air host, entrepreneur, and brand Ambassador with a penchant for style, pop culture and travel. 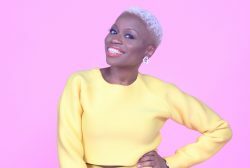 Dana’s corporate career in marketing began to flourish: Vogue, ESSENCE Magazine, Complex, launching an e-commerce business called doBrasilShop.com, etc. From campaign ideation to casting and video shoots, she was serving a piece of her creative mind. However, once introduced to the talent that is on-air hosting, Dana became delirious with excitement and energy. She found a medium that married her theatre/dance background with her business acumen. From conducting interviews with film and television’s hottest celebrities at red carpet movie premieres to forecasting fashion’s top trends straight from Lincoln Center during New York Fashion Week , Dana felt right at home in front of the camera or creating behind it.